We love the insulated, durable Therm-o-Tote. Seriously. It’s such a great bag that you would think it would come at a higher price. The Therm-o-tote is constructed in a similar fashion to our Big Thunder Grocery Tote. Both feature 100 gsm nonwoven polypropylene for strength and full wraparound handles for durability. Both also have a bottom insert. 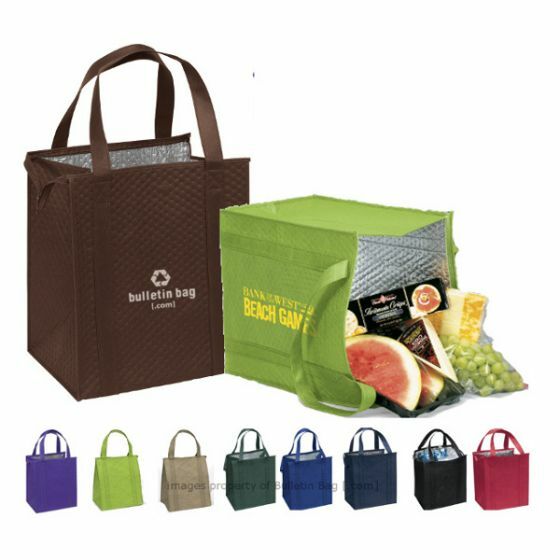 Pair all of that with an insulated lining, and you have a great bag for grocery shopping, picnics, the beach—or anywhere you need to keep food or drink warm or cold. Our staff reviewer uses the Therm-o-Tote insulated reusable bag for all of the above! Just don’t forget to wash it inside-out in warm, soapy water or spray the inside and wipe it down. I love this bag and. I want to purchase it….from where can I get it? Let me know plz..
Hi! 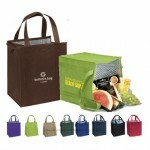 Please request a quote for this bag and one of our account managers will get in touch with you!